We have had the neatest opportunity to attend a class at our church called "Heart Talk". It was designed and is taught by one of our associate ministers and it has been life changing for me! The purpose of the class is to help you see, find or realize why you behave the way you do in your relationships - any relationship not just your family.On the first week Allison closed out the session with this question, "Where is your heart?". She followed that question with great descriptive examples, "Is it locked away and you've hidden the key? ", "Are you holding it safely in your hands? ", "Is it on the shelf across the room? ", "Have you left it behind somewhere? ", "Do you even know where your heart is?". To be honest, I couldn't answer that question right away - I really had to think about that one. In the end, I decided I wasn't sure where I had left my heart. The last time I remembered looking at it, it was bitter, brittle, frail, and hemorrhaging . I'm pretty sure I had left it on the side of the road somewhere - hoping someone would come along and rescue it, but that's not what happened. See, even if you think you've left it somewhere far away to avoid whats ailing it, it's still a vital part of who you are. It still carries you through every moment. It's the condition of your heart that matters most, have you been taking care of yours? I know I had not been taking care of mine. I had given up my responsibility for my heart and instead had put that responsibility onto the shoulders of so many other people in my life. I'm pretty sure that is why I remember last seeing it in that awful condition. I had forgone my personal responsibility for my heart and my actions in life. I certainly had no idea this is what I had done, until I began crying out "WHY GOD?" for so many situations in my life. When you start asking God questions, that you think you really do want answered, you need to be prepared for the truth - even if comes across as an ugly one! The first time I thought I wanted to hear the answer, it was devastating news to me when I found out. I sobbed, for days and then brushed it off thinking that could not possibly be what was wrong with my life. A couple of months went by, and I still wasn't satisfied with the way things were going so I cried out again. That's when "Heart Talk" began, and the same ugly truth appeared again. I giggled and thought, "I think I can take a hint Lord". I began taking action to better the condition of my heart and the way I live my life. And then The Lord thought he should nudge me one more time, just to make sure I got the clear picture - and this time, without me asking he revealed the truth to me again! I finally had to laugh and tell those closet to me - "I think God is trying to make something very clear to me. OK GOD - I THINK I'VE GOT IT". The first time I thought I wanted to hear God's answer, I was spewing venom in my husbands direction my wise counsel stopped me, interrupted me and laid it on me - and it hurt. The second time I asked God to give me this truth, it revealed itself through a few self examination questions for the "Heart Talk" class. And the third time, when God wanted to make sure I knew what he was saying, was through the results of a personality profile I had to complete for my job. One answer, in 3 distinctly different deliveries. At this point it was loud and clear! Stop blaming everyone and everything else around me for the condition of my heart. Take responsibility for my words, actions, reactions, thoughts, and attitude.Own my mistakes and quit being the victim. Ya'll this is hard to do - for me. I've spent most of my life living in a fantasy land that I am perfect and you are not. It could not possibly be my fault that I handed out pieces of my heart to specific people in my life and then made them responsible for taking care of it. It is not my fault they did a poor job at something they should have not been asked or told to do. It is not my fault - it can't be. Well guess what I have learned? It was and is my responsibility to be the sole caretaker of my heart. If I gave away pieces of it to people who should not have been in charge of it - and it got broken, that is my fault. If I choose to believe the lie that I am perfect and your are not, that is my fault when things go badly for me. When I set my expectations out of reach and then no one, including myself can meet them and I am devastated by that - it is my fault. It is not your fault if I have placed an unattainable expectation on you! What I am learning is that it really is OK to not expect much or anything for that matter out of other people or myself. I am now realizing everyone has their own heart to tend to and I should be respectful of that. This process has been hard, difficult, and challenging, but it has also been insightful, eye-opening, and life changing. I catch myself starting to place to blame and then realize I have no one to blame. I've always lived a relatively quiet, rule following, good life and never could see myself as that "awful" sinner that Jesus radically changed and saved. But I'm beginning to learn what that feels like. I am so thankful that his mercies are new every morning, because in this process I have needed many "new days" to start again. I have had terrible relapses, some I realize quickly and make the correction, and others take longer. But because of God's grace I am learning from my mistakes and doing better daily. I must say when I asked God, "Why?" to so many things in my life I never intended to be the answer to my own problems. The ugly side of me is just not pretty and if you've seen that side of me in the past or recently - may I ask for your forgiveness? Thank you Jesus for loving me and my ugly side enough to die on the cross to take on my sins and pains. Thank you for giving me forgiveness and salvation when I chose you. Thank you for saving me from myself. Thank you for wise counsel that will tell the truth, even when its ugly. 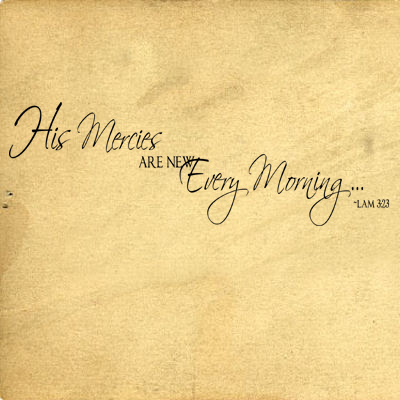 Thank you for your grace and mercy that helps me make it through each day. Thank you for accepting me, all of me. Thank you for being the only person I can truly trust with my whole heart. Thank you for not making us walk through this life alone. Thank you for those in my life that will always stand next to me, even when I'm ugly. Jesus, Thank you! So...have you looked for your heart lately? Do you know where it is? Who has it? What condition it is in? Let me challenge you to seek to Lord and see if you can honestly find it. Until Next Time, Be Blessed, and Be a Blessing! PS - Since we last talked - my babies both had a birthday!